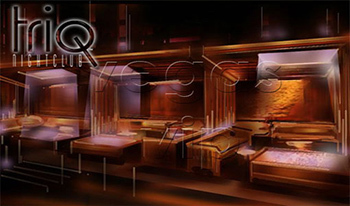 Triq Nightclub Las Vegas Triq is a multi-level venue and also houses magic performances by world famous acts such as Steve Wyrick and Ron Lucas. At the downstairs level of Triq is the main bar where you will find gorgeous Triq go-go dancers entertaining the crowd to the many beats of hip-hop and house music. There are various tables reserved for bottle service downstairs. These tables have velvet ropes surrounding them giving clients a feeling of exclusivity as they are seated comfortably in the black leather sofas and chairs. As you pass by the main bar downstairs you can't help but notice the four plush, private cabanas which are raised to overlook the crowds of people on the downstairs level. Each cabana is over-sized and has its own stripper pole and private VIP table with seating for up to 12 people. The cabanas are semi-private with drapes separating them to allow clients to have their own party within the nightclub. As you stroll up the stairs by the DJ booth, you will see another bar located mid-level for the convenience of customers not waiting in long lines at the bar fighting for drinks. 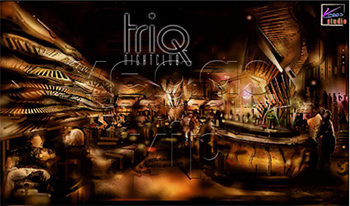 Triq Nightclub and Ultralounge is the hottest new club and after-hours 'place to be' on the strip located in the Planet Hollywood Hotel and Casino. This hotspot is conveniently located just inside the Aladdin Mall Shops and is just steps away from valet parking at the Aladdin. Triq is a multi-million dollar project that is sure to grab your attention as you walk through the door. The beautiful and friendly staff, upscale ambience, and private cabanas each with its own stripper pole are just a few of the things you will notice as you walk in the main entrance of Triq. 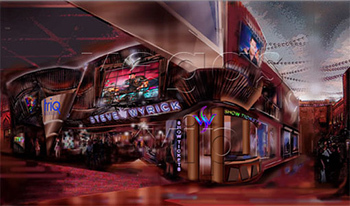 As you enter the main showroom of the nightclub, (which is also where daytime magic acts Vegas attractions are held) the 30 foot tall LED lighting screen will be sure to grab your attention. The stage is turned into a huge dance floor with go-go dancers entertaining the crowd and keeping the energy level high throughout the room. Surrounding the stage is custom made European-style furniture fit for a king. This allows clients to lounge comfortably, have bottle service, and be entertained by the most beautiful crowd Las Vegas has to offer. Triq is known for it after-hours dance crowd. At three AM the club continues to keep people on their feet and the energy in the room is felt from the floor to ceiling. As the night goes on and the sun begins to come up, Triq after-hours is still pumping out dance grooves and proves that Vegas is the real city that never sleeps.